Whoever said learning to swim was easy? It actually takes time, training and courage. 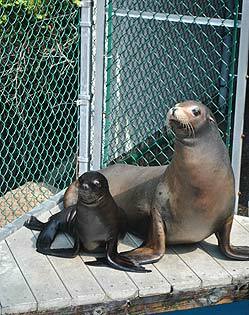 Our resident 3-month-old sea lion pup, Colby, is proving his bravery each day. Through help from his trainers, Colby has learned to swim. He still spends a lot of time on land where he feel safe, but he has taken a few short dips in the Oceans of Fun, 18 foot deep, main show pool where he has daily access from 10 a.m. to 4 p.m.
Colby, who’s grown to 48 pounds, will nurse from mom, Makaia, until he’s about seven or eight months old. He’ll start his formal show training when he’s nine months old. Read about Colby when he was younger and view an earlier video of him by clicking here. Show Times: 10:30 a.m, Noon, 1:30 p.m., 3 p.m.
Meet & Greet our resident marine mammals: 10:30 a.m., Noon, 1:30 p.m., 3 p.m.
Get up close. 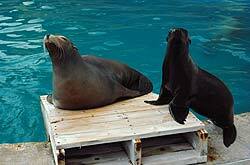 Try your hand at animal training and learn to feed a seal or sea lion.